The monster we once feared hiding under our beds, has grown into the real one hanging over our heads. “A well regulated militia, being necessary to the security of a free state, the right of the people to keep and bear Arms, shall not be infringed.” ~ Thomas Jefferson, John Adams, John Hancock, Ben Franklin, Sam Adams & Co. In 1954 the total average cost for an appendectomy, figuring a higher than average hospital stay of five days, was $298.33 in New York. (sourced here )Today the same medical procedure costs $33,000.00. 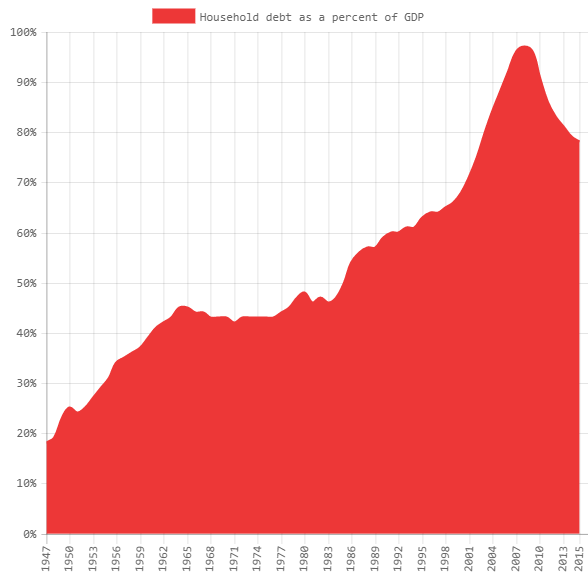 (sourced here )In 1954 average household debt was 30% of GDP. Today it is somewhere in the 80% range. $16,000 on credit cards, $27,000 in auto loans, $48,000 in student loans, and $169,000 in mortgages. (sourced here ) If we use the average annual percentage rate of inflation of 4%, the $298.33 it cost to have one’s appendix removed should only cost $2,626.01 in 2017. So, what’s really going on here? There are people who read my Tune-up every Sunday on both sides of the median. What I have to say is as equally pertinent to the highly successful business executive earning over a million dollars per year, as it is to minimum wage earner living paycheck to paycheck. The Red Monster pictured at the top of the page has been around since Eve took the tragic bite. In fact, it was sired by the very same tempter, and has been fed, groomed, and nurtured by the same ever since as the most effective means imaginable to enslave mankind. As Tucker Carlson put it so well, they (wolves) don’t want gun control…they (wolves) want people (sheep) control. One of my all-time favorite sheepdogs is Sheriff David Clarke. I had the pleasure of meeting him and shaking his hand and thanking him a few years ago. The great thing about a good sheepdog is that they can smell and track the wolf all the way to Parkland, Florida. This entry was posted in Economy, Entertainment, Politics, Religion, Society, Uncategorized and tagged 2nd amendment, AR15, barnhardt, debt, effeminacy, gun control, parkland, reclaim ny, sheriff clarke, soros, trump. Bookmark the permalink. From a Fellow Sheepdog: “Well written, however corrections are necessary. So , their debt is our credit…they owe us, the people, the credit. Guns are for stopping anyone from taking anything from you , your stuff, life , property ( such as a gun ) … , period. So if they threaten or try legislating or creating anything that they think gives them power or authority to steal , then, the gun..simply is the tool required to stop the theft whether it be stuff, your life or freedom or some others stuff or life or freedom. Being a Sheepdog is what every man is tasked with in regards to himself, his family , his nieghbors , the innocent , the widow , the infirmed, and even the idiot.